This was a pleasant surprise upon arrival. It has more color to it than pictures can show. Very easy to hang, we placed it on a wall in a large hall and it adds a nice touch of elegance. Dimensions 3.0 In. X 44.75 In. X 25.0 In. 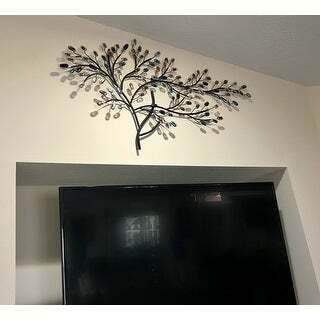 I thought I knew where I was going to hang the Harper Blvd Willow Multicolor Metal/ Glass Tree Wall Sculpture but after I received it it was just too big for the spot. I think I will hang this in my dining room. It is a really nice piece and I would buy it again. Nice large tree, the glass stones are about 11/2 x 3/4, much larger than I expected. I am very pleased with on purchase. Absolutely beautiful. The picture doesn't due it justice. is very classy and looks much more expensive then it was. Have it in my entry and always receive compliments. The ironwork and finish is unique brown and the leaves hsve a slight green in them. Exceeded my expectations. Very eye pleasing wall sculpture. Looks best in a bright room as the variation is colored glass - leaves do not show in dimly lit area. 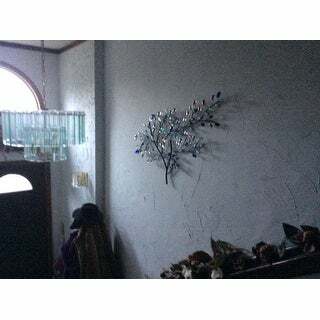 The leaves of colored glass add a very nice dimension as compared to all metal tree-form wall sculptures. Made well with iron frame, one stone was off in the package but able to be easily glued. I am very pleased with the purchase. 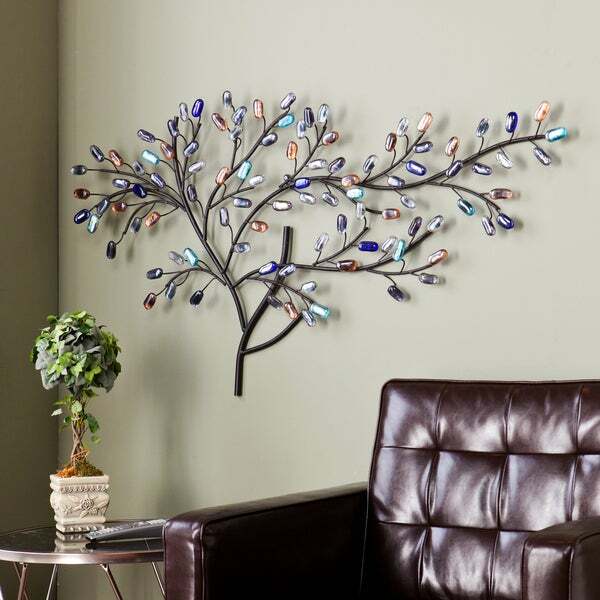 love the multicolor metal/glass tree wall sculpture. Everyone complimemts on it. this tree sculpture is really pretty. The mix of the metals and "jeweled" stones make an eye catching wall decor. The size is great as I needed something larger for a single wall. I am very happy with this tree sculpture and highly recommend it! Beautiful piece, no quality issues. A lot more blue than I expected but I love it. 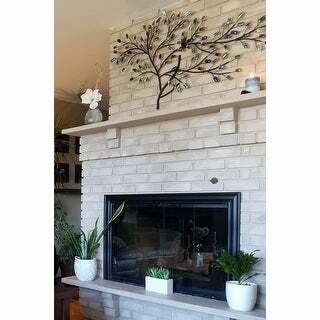 Looks great over the fireplace, not overwhelming. For reference in the picture, the mantle in 30" to the ceiling. 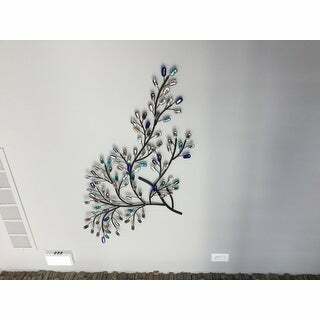 I love my Harper Blvd Willow Multicolor Metal/ Glass Tree Wall Sculpture! I received it in excellent condition. It was delivered a day early. I don't really buy on line but this was a very positive experience. I will definitely buy from overstock again. 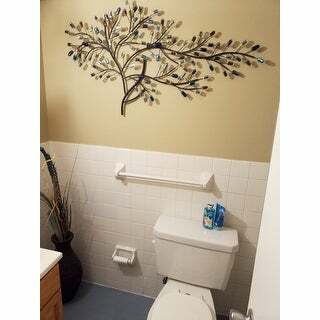 Want to enhance and brighten that "birth canal" wall in your home? This art piece certainly fills the criteria for sophistication and flow to distract one from that already confining area that leads from one room to another. Very well constructed, and it absolutely sparkles each time you turn on a light source. In an open wall, it adds texture and dimension to any room. Affordable and stunning! This has made my living room so rich looking. I love it. Anyone who walks in compliments it right away. I'm so pleased with this! I get more compliments on this than anything else! Bright, ever-changing sculpture is creative and versatile. When the light hits it, it sparkles and changes in color. Very nice size and does not protrude much so can be placed anywhere! Beautiful in my small bathroom! 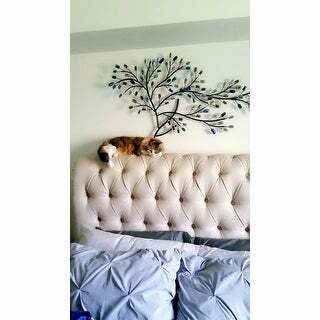 Oh the compliments.. it has inspired me to change my whole decor! Really love this piece. The colors are not extremely bright or noticeable unless there's quite a bit of natural light shining on it, which my bedroom doesn't get. But I still think its a beautiful piece regardless. It is beautiful but I am waiting for my handy man to hang for me. Ever have one of those spots that needs something but you can't find an item to fit the spot? This artwork filled the bill. Not only does it fill an empty area above or TV in the living room, it does it with style. The picture doesn't do it justice except to show the good fit. It is very easy to hang on the one keyhole mount. We are very happy with it. Perfect colors for guest room, I change the bedding for decor that is seasonal. It matches all colors. 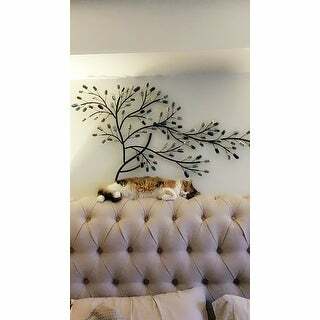 It's perfect for my bedroom. The colors brighten the room. This so beautiful made and the colors are beautiful. Beautiful piece and it added a lot of style to the room. This tree branch is beautiful & classy. "I am undecided between this look with the stones or a plainer type look in metals. Are the stones pretty sturdy and do they hold up well or do they tend to be heavy and some fall off?" The stones should be sturdy and not fall off. The sculpture is every bit of 14 lbs, but the "stones" do indeed glisten as promised. Hangs on 1 hook/screw so I do recommend putting a 2nd under the top branch, if only for some peace of mind. If you have other metalwork on your walls I could see where you might go with something plainer. For me this is a featured piece, so I definitely would go with the colors. IMHO It doesn't come off as gaudy or cheap. "If you are facing the piece can it branch to the left instead of right?" It cannot be faced a different direction, as it is welded into that position. Not unless you hung it upside down. "How is it hung? I could only see 1 attachment in the picture." There is a hook for a screw on the back of the piece. It is located towards the middle of the sculpture. Mine is hanging outside under a covered porch and screwed into my stucco house. I've had it for 6+ months; no rust or issues with the stones. Still looks new. There is a large hole in back a and it hangs well with one medium screw (you provide) ,and i would put in a wall anchor first (those blue plastic things) ,VERY easy and it balances well. Loved it SO much I bought 2. One I hung some medals / cross from. It sits off wall a bit . So worth it and O usually has good sales and coupon. You can put over a bed, in hall, over a low buffet, bookcase or bathroom. Near a window so glass catches light is nice too. Hope that helps. Mine is hung by the one mounting hole on drywall with an anchor to help hold it. Voila! No problems at all. I have mine hanging in my living room, but I would assume you could hang it outside under roof. I would not expose it directly to rain, as the stones are glued on. It would be a nice decoration for a porch or sunroom that is somewhat enclosed. I think the sun would reflect so nicely off the stones! I wouldn't advise it. The metal will rust and the jewels will cloud up with moisture and it will definitely lose it luster and vibrancy. "I have black furniture in the master bedroom and want this for over the bed. The colored stones will go nicely but wondering if the metal tree itself is a dark brown or black." It goes well on very light colored walls. Black metal finish as indicated in the description of the product.